Concrete homes are obviously constructed from concrete, but it is also possible to use other materials in combination with concrete such as steel, fibre, plastic, glass, wood and other improved materials. Today, concrete is being widely used for the construction of commercial, residential, institutional, and industrial buildings. This is mainly because of its versatility, cost-effectiveness and the easy availability of raw materials to produce it. There is a great interest today in concrete home construction. This attention is largely focusing on sustainability, green building, disaster resistance, energy conservation, and safety. Engineers have attempted to come up with design ideas that meet these requirements in the best possible ways. Designers have applied numerous design ideas to construct concrete homes due to its versatility and easy availability of construction materials. Motivations that enforce or led to new design ideas are different, for instance, some design ideas took inspiration from nature whereas some from energy efficiency, aesthetics, sustainability, and recycling materials. In the following sections, some of the most exceptional and award-winning design ideas used for construction of concrete homes are presented. This two storey house is constructed from a cluster of interconnected structures that work together to create a harmonious whole. It is said by the designer, “This concrete house is an example of how concrete can be used both structurally and aesthetically to stretch the boundaries of creative expression”. 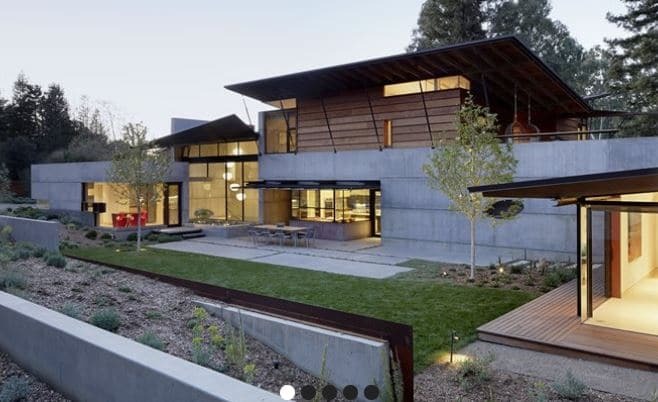 Concrete is utilized to construct this home in a way so as to maximize energy savings, improve indoor air quality, and create distinctive living spaces. Substantial energy savings can be acheived by using ICF forms for the exterior walls of the home. Moreover, outstanding environmentally friendly attributes of this concrete home include polished and integrally colored concrete floors on the main level with in-slab radiant heating and insulating concrete form walls. 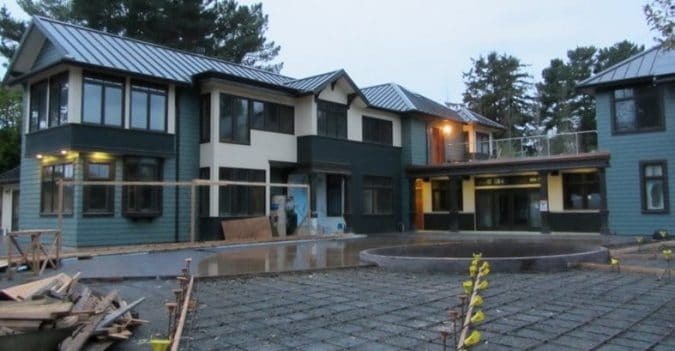 In addition to geothermal hot-water heating, a 7-kilowatt solar electric power system, the house has a green concrete roof deck that sustains plant growth and reduces stormwater runoff. Stephen Bohner of Alchemy Construction is the builder of this house. It is constructed from concrete and reclaimed brick with tile and wood accent. The area on which the carbon neutral house is constructed is 175 square meters. 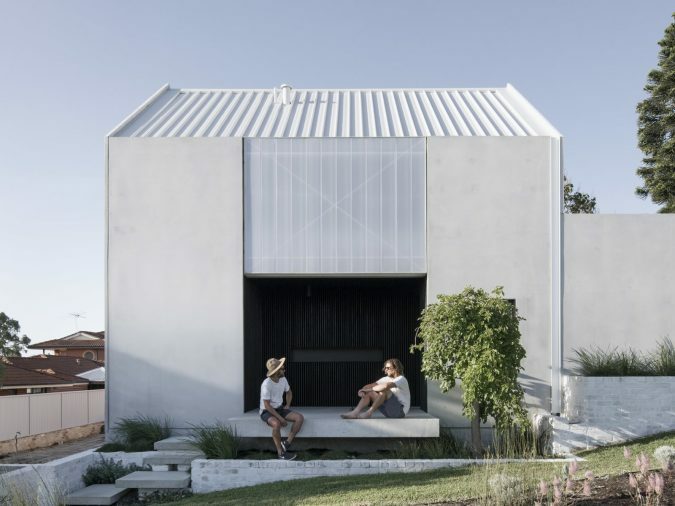 It is built in Australia, and the key to design is a generous connection to the rear courtyard, which makes it possible to live outside for half of the year. Greater details regarding this concrete home can be found on www.dwell.com. The architects claimed that the spaces in the house are merged to obtain both privacy and openness at the same time without the need for doors and walls. 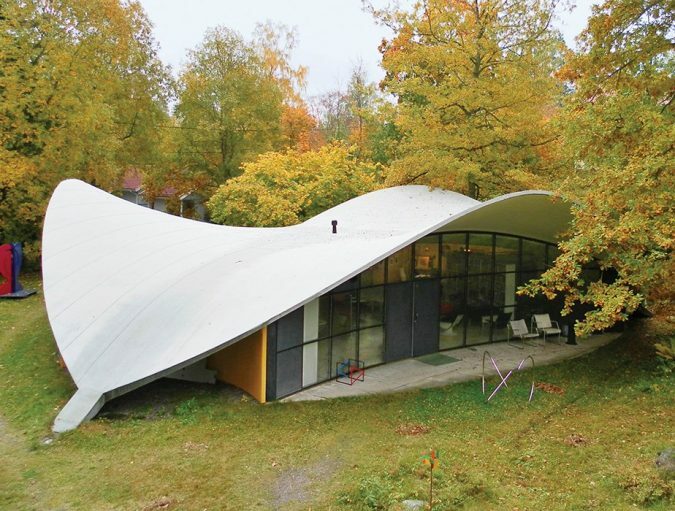 As it can be seen from the figure, the shape of the concrete roof is inspired from the shape of a leaf that appears to be floating over a glass-house. These types of concrete houses are suitable for small families because they are fairly small and inexpensive. An example of affordable concrete house is shown in Fig.5. 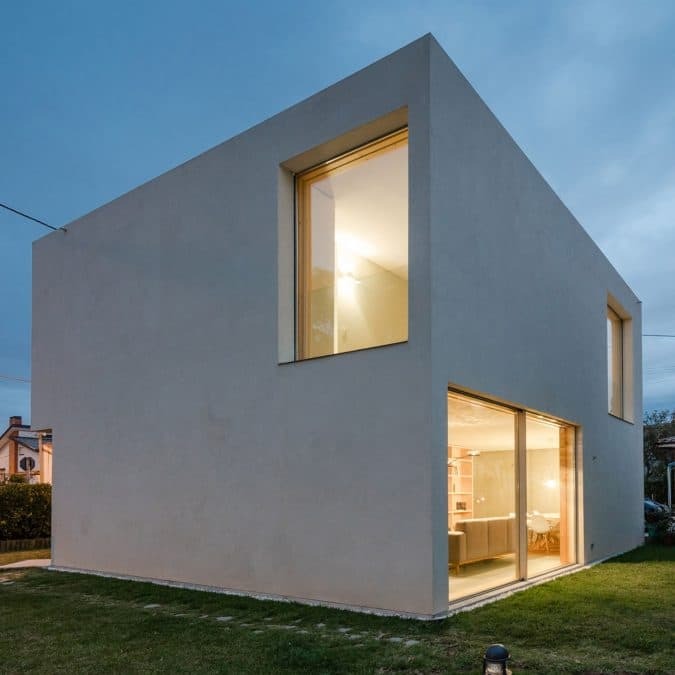 This cuboid concrete house, which is designed by José Carlos Nunes de Oliveira is suitable for a family. The designer left the interior concrete walls bare and added as few partitions as possible in order to keep the budget down. One of the most outstanding properties of concrete is its strength which provides comfortable shelter from inclement weather, and minimizes property damage while protecting occupants from extreme weather and natural disasters. It is another favored feature of concrete which declines the need for future maintenance of homes. Concrete is a versatile material from which any shape and form can be constructed. This property allows designers to make innovative designs based on the demand of client and situations under considerations. Materials required to produce concrete can be achieved locally. Recycled materials such as recycled aggregate, pozzolanic cementitious materials such as fly ash and silica fumes can be used to produce concrete. This would lead to decreased CO2 emission during cement production since a smaller quantity of cement would be required to be produced. Concrete homes provide several advantages and benefits during their life span. For instance- cool indoors and hence reduced energy consumption, and ability to withstand disasters like fire; hurricane; earthquake; and flood. Added to that, due to the fact that concrete has low volatile organic compound, it does not influence indoor air quality. Lastly, it can be recycled to produce recycled concrete aggregate.